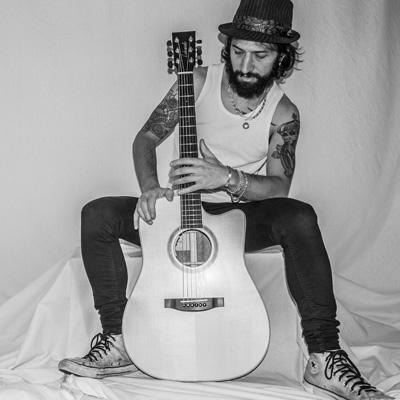 At the age of fourteen, in 1994, and self-taught, he began playing the guitar in Reinosa, his hometown, always influenced by the blues, rock & roll and hard rock music. He has been influenced by national and international groups of these genres, which accompanied him as a child, teen and adult, by building a very personal "soundtrack". Living surrounded by mountains listening continuously this sublime harmony, have influenced himself and his way to perform as an individual and certainly as a musician, have shaped his own character, which has enabled him to become one of the most important guitarists in the Spanish music scene. Later on, the success and big national and international tours would be happening with LA FUGA, band in which he entered with only seventeen, and was and is everything to him since then until now in UK, Mexico, Argentina, Chile, Uruguay, Colombia or Ecuador and other countries. But before LA FUGA he began to set, to forge, in FILO BLACK, band of friends, compadres, where they begin to expel the likes and phobias, where it all begins. Dreams, illusions... where destiny is imagined. Where he imagined his own, where many people began to see that 15 years old lanky and shy kid was meant to make something big. His albums recorded with LA FUGA and collaborations on albums by various artists far exceed twenty. And since 2011 he combines his life as a devoted rock & roll musician with his work as a music producer in his own Recording Studio "Estudios Clip". I can categorically say that Nando enjoys every moment of what he does, what he is. In each tap on each successful strumming. In every moment on stage and out of it, he spreads the joy of a happy man. The joy and satisfaction he generously shares in capital letters and without middle voices and he enjoys sharing that happiness and that joy with the public in the stadiums, arenas and large rooms. And the other Nando. The closest, the smallest, where bar and late conversations come through, the compadre and fugitive. To the privileged ones that are among his good friends.